PocketECG CRS – break-through solution for Mobile Cardiac Rehabilitation, available now in the U.S.
Who uses PocketECG CRS ? CR is a comprehensive training, education and behavior modification program designed to improve the physical and mental condition of patients with heart disease. PocketECG CRS is the next generation in cardiac rehabilitation monitoring. Roughly the size of a smartphone, the device combines flexible, remote intensity controlled workouts with comprehensive ECG monitoring to help patients safely recover from a cardiac event, reduce the risk of hospital readmissions and improve quality of life. Full disclosure ECG signal streaming through a mobile network, as well as automated annotations for each heart beat. The system guides patients in real-time, instructing them with visual and voice commands to increase or decrease workout intensity based on measured heart rate (HR) and an established set of HR thresholds. 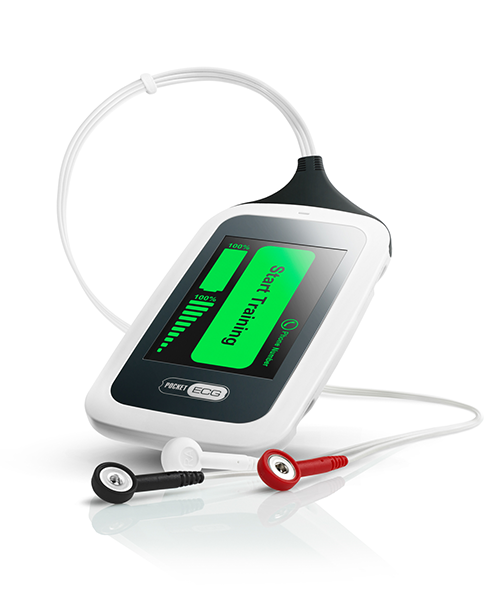 PocketECG CRS was FDA Cleared and is under US patent. PocketECG CRS is the most flexible approach to cardiac rehabilitation. It requires no specific exercise equipment, giving physicians and patients the ability to customize workout regimens. Patients can use treadmills, stair climbers or any other exercise machine, even prescribed and supervised walking programs outside of a facility. The only mobile Cardiac Rehabilitation (CR) system that can be used at any location – in hospitals, in outpatient settings or even remotely, while under medical staff supervision. The device continuously streams a full disclosure ECG signal to provide online arrhythmia diagnostics and analysis. Monitor unlimited numbers of patients, simultaneously. PocketECG CRS transmits full disclosure ECG signal in real-time, along with automated arrhythmia detection. Visual and voice commands lead patients through workouts, and prompt patients to intensify or de-intensify physical exercise based on pre-set heart-rate thresholds. A built-in accelerometer monitors physical activity, and correlates with heart rate and arrhythmia detection.